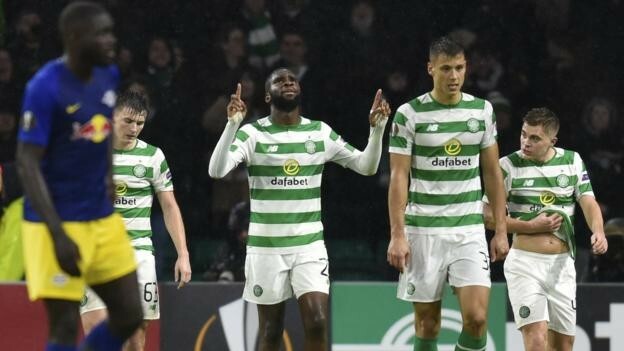 Celtic kept their hopes of reaching the Europa League knockout phase alive with a dramatic victory over RB Leipzig at Celtic Park. Knowing defeat could eliminate them with two games to go, Kieran Tierney put Celtic ahead early on. Leipzig's Jean-Kevin Augustin equalised with a header late in the second half but within a minute Odsonne Edouard struck to give Celtic the win. They travel to Trondheim to face Rosenborg next on November 29, before finishing at home to Salzburg a fortnight later. Match ends, Celtic 2, RB Leipzig 1. Second Half ends, Celtic 2, RB Leipzig 1. Offside, Celtic. Craig Gordon tries a through ball, but Odsonne Edouard is caught offside. Substitution, Celtic. Kristoffer Ajer replaces Scott Sinclair. Attempt missed. Kevin Kampl (RB Leipzig) left footed shot from the centre of the box is just a bit too high. Assisted by Jean-Kévin Augustin. Corner, RB Leipzig. Conceded by Filip Benkovic. Corner, RB Leipzig. Conceded by Youssouf Mulumbu. Kevin Kampl (RB Leipzig) hits the bar with a left footed shot from the centre of the box. Assisted by Matheus Cunha. Substitution, Celtic. Youssouf Mulumbu replaces James Forrest. Offside, RB Leipzig. Konrad Laimer tries a through ball, but Bruma is caught offside. Bruma (RB Leipzig) wins a free kick on the left wing. Offside, RB Leipzig. Marcel Sabitzer tries a through ball, but Jean-Kévin Augustin is caught offside. Attempt blocked. Diego Demme (RB Leipzig) right footed shot from outside the box is blocked. Goal! Celtic 2, RB Leipzig 1. Odsonne Edouard (Celtic) right footed shot from very close range to the bottom right corner. Assisted by Ryan Christie. Goal! Celtic 1, RB Leipzig 1. Jean-Kévin Augustin (RB Leipzig) header from very close range to the bottom right corner. Assisted by Konrad Laimer with a cross. Attempt missed. Jean-Kévin Augustin (RB Leipzig) left footed shot from the centre of the box misses to the right. Assisted by Bruma. Attempt missed. Filip Benkovic (Celtic) header from very close range misses to the left. Assisted by Callum McGregor with a cross following a corner. Corner, Celtic. Conceded by Yvon Mvogo. Attempt saved. Odsonne Edouard (Celtic) right footed shot from a difficult angle on the right is saved in the bottom left corner. Attempt missed. Bruma (RB Leipzig) right footed shot from outside the box is close, but misses to the right. Attempt blocked. Marcel Halstenberg (RB Leipzig) right footed shot from outside the box is blocked. Attempt saved. Marcel Sabitzer (RB Leipzig) header from a difficult angle on the left is saved in the centre of the goal. Assisted by Marcel Halstenberg with a cross. Corner, RB Leipzig. Conceded by Dedryck Boyata. Attempt blocked. Matheus Cunha (RB Leipzig) right footed shot from outside the box is blocked. Assisted by Marcel Halstenberg. Hand ball by Tomas Rogic (Celtic). Substitution, RB Leipzig. Diego Demme replaces Nordi Mukiele. Callum McGregor (Celtic) wins a free kick in the defensive half. Corner, RB Leipzig. Conceded by Callum McGregor. Corner, RB Leipzig. Conceded by James Forrest. Nordi Mukiele (RB Leipzig) wins a free kick on the right wing.